First let's first assume something: You will be renting the "big ticket" items necessary to ski; by which I mean skis, boots and poles. Kudos to those of you who have a place to keep such things in a New York apartment, because I sure don't, so rentals it is. Anyway, let's get down to the business of folding, rolling, compressing and heavy amounts of editing. Not too long ago I bit the bullet and got myself the "Bigger Carry-On" from trendy AF luggage company Away. I know everyone's talking about them and the hype can be off-putting, but I really love this bag. The compression side of the bag can fit a ton of stuff, and the charging port on the top is really handy. When I went to Ireland in November I brought an absolutely unbelievable amount of stuff in that bag—enough for a black tie wedding, two cocktail attire events and five days of running around in the damp Irish countryside. I have no doubt that this bag can handle my ski weekend needs. *If you buy one through the link above (or right here), you can save $20! 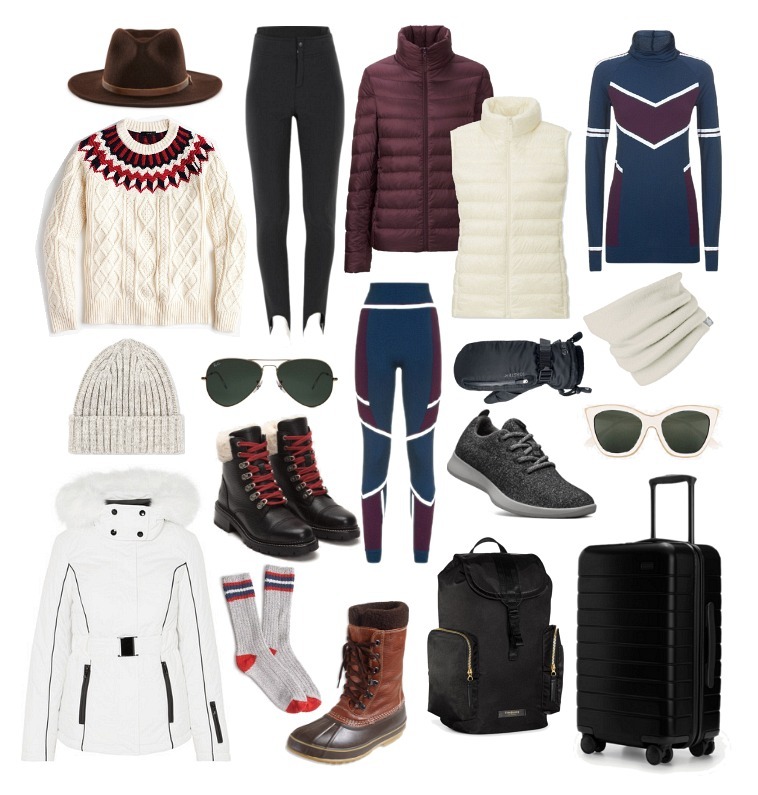 Personally, coordinating items are my key to not overpacking and also making sure I have everything I need for skiing. My base layers for all activities will be this matching set (blessings to you, Sweaty Betty), and pretty much everything I'll wear with them falls into the same color scheme. The leggings and coordinating turtleneck can be layered with my burgundy Heattech fleece and down vest from Uniqlo, as well as my white Turtle Fur neck warmer. These layers should also be enough for activities like snowshoeing and cross country skiing on their own. The big challenge with a ski trip out east is the temperatures—along with having kind of puny mountains (sorry, it's true!) it's also astronomically colder than skiing in the Rockies for reasons you need a meteorologist to explain. Getting enough warm gear into a carryon is no small feat, but here's my plan. Mittens instead of gloves: I have these Swany 'Toaster' mittens, which have a zipper on top you can use to release the glove liners inside that have touchscreen capabilities—which means I can text or get at my chapstick easily without taking off my mittens completely. And, they're so warm. Tights to wear under my base layer: That's right, a layer under your base layer! I often wear a pair of standard issue (but nice and high-waisted) opaque black tights under my base layers for some added warmth. They're not cheap, but Spanx are the bomb for this scenario. (I know they don't "wick" like normal sports fabrics, but whatever.) Also, they pack tiny! In-boot ski pants: I have an older pair of Burton ski pants that go into my boots that I love, except that they are more low-waisted than I'd prefer. (Snowboarders are cool like that.) I've been on the hunt for an affordable upgrade that's designed for skiing, and these AFRC stirup pants look like a great choice! One one pair of jeans: Personally, I'd go with your favorite high-waisted black skinny jeans, but whichever jeans you wear the most often in the winter is your best bet. Skip the cool Levi's, skip anything cropped. You want to be able to tuck your jeans into tall snow boots and let them fade into the background of your outfits so no one notices that you're wearing them multiple times. One flannel or denim shirt: Ski trips are not the occasion for your favorite going out top. Even in Aspen and Sun Valley, mountain nights out are more casual. Bring a shirt that does double duty for day and night, like a flannel (I like to wear a men's version) or a denim shirt that will make for the perfect Canadian tuxedo or easy contrast with the aforementioned black jeans. Be choosy with your accessories: If you know you'll be going out at least one night, throw in a pair of statement earrings to go with your casual shirt. If you're tempted to bring like, a lot of hats (just me?) try to limit yourself to one beanie and one wide-brim. And if you have to throw in a beret, too, so be it. And sunglasses? Well I have a problem with always overpacking them, but I'd go with one pair of practical polarized shades (for cross country skiing or snowshoeing) and one fashion pair for everything else. If you insist on bringing a blanket scarf, wear that too. A strange thing about me is that when I'm on a ski trip, I don't like scarves. I just like to wear a hat and a warm coat and call it a day—dealing with scarves in bars or when you're walking in and out of heated shops and restaurants is a pain to me. So, I don't know, if you've gotta have it, wear it. If you bring the aforementioned wide-brim hat: You gotta wear that, too, or tuck it in your tote bag. Make your "personal item" work overtime for you. I don't love bringing backpacks on planes, as a general theory. I think they're difficult to get into, and make it hard to access everything you need before you get on the plane. However, if you've gotta use it to fit a few more essentials, so be it. (I like this one from Timbuk2 that looks like 90s Prada.) Otherwise, I'd go with a zip-top tote bag, so you can easily stow it without worrying about spillage.